As Liverpool city-centre regenerates, the remaining patches of neglect stand out more clearly. 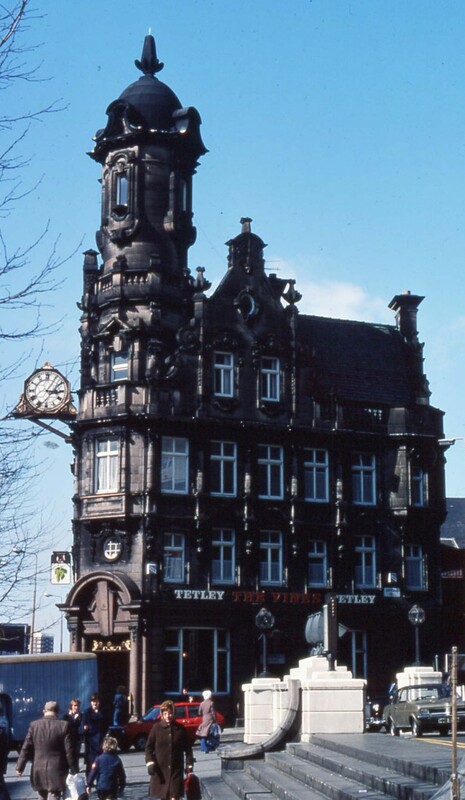 The east side of Lime Street has been neglected for years, and yet the stretch between the Crown and the Vines pubs includes a spectacular landmark building that still, somehow, remains in one piece. The Futurist Cinema, originally the Lime Street Picture House, was the first purpose-built cinema in Liverpool, opened in 1912. It was the first to show sound movies, in 1926, three years before The Jazz Singer at the Olympia, West Derby Road. It converted to Cinemascope in 1954 without interrupting performances, and at the end of its long history it was the only place in Liverpool fitted with Sensurround for the film Earthquake (1975): [http://www.in70mm.com/newsletter/2004/69/sensurround/about.htm]. It closed in July 1982 and has remained empty and untended ever since. Kim Ryan’s film of the Merseyside film-maker Alex Cox revisiting the Futurist shows the interior in 2008: http://www.youtube.com/watch?v=Y2_JRTwP4J0. An April 2013 news article raises the question of whether the building is beyond saving: http://www.clickliverpool.com/business/business-news/1218614-back-to-the-future-futurist-building-set-for-revamp.html. The campaign to save at least the façade of the Futurist is at http://thefuturistcinema.wordpress.com. 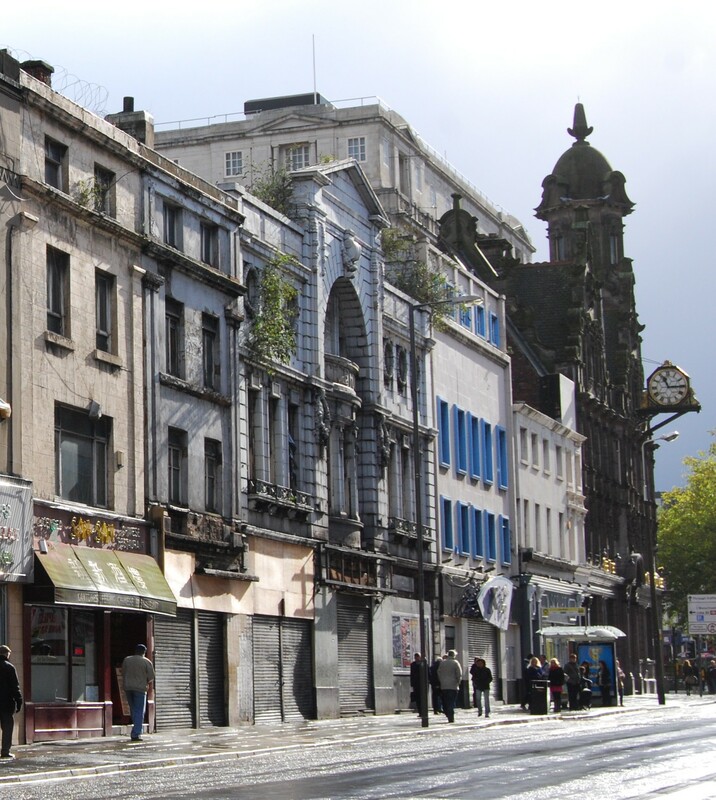 A more recent Victorian Society alert to threats to the Lime Street streetscape is at http://www.victoriansociety.org.uk/news/damaging-lime-street-plans-could-further-endanger-liverpools-world-heritage. This is supplemented by the SAVE Britain’s Heritage objection to demolition: http://us8.campaign-archive2.com/?u=9ea03bb11e3ccc82634488e2b&id=63d3031744&e=68a86e2740. Update: After a protracted legal process, the campaign to save the Futurist failed, and demolition followed almost immediately: http://www.liverpoolecho.co.uk/news/liverpool-news/demolition-historic-futurist-cinema-begins-11697085. This entry was posted in Fun Palaces, Liverpool's Heritage, Victorian Architecture on January 29, 2014 by Mike Higginbottom. Reputedly the largest remaining single-screen cinema auditorium in Britain, with 2,150 seats, the Futurist Cinema, Scarborough closed its doors on Sunday January 5th 2014: http://www.yorkshirepost.co.uk/news/main-topics/general-news/scarborough-s-futurist-theatre-closes-as-saviour-is-sought-1-6354622. 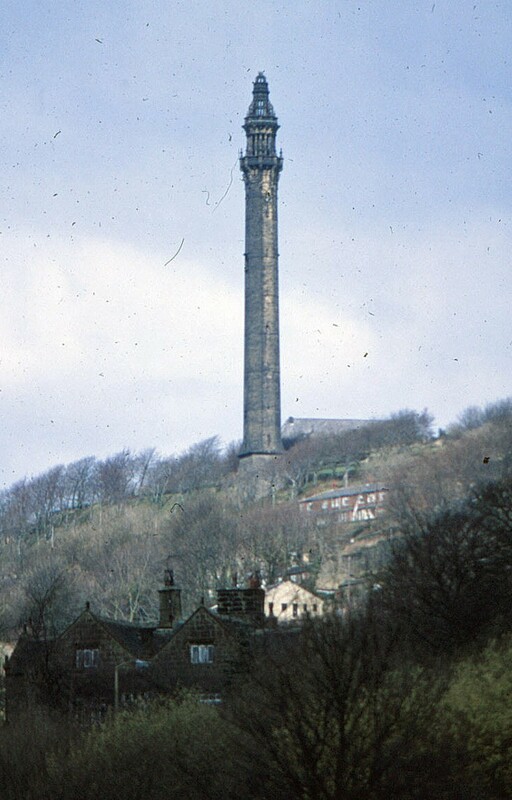 It was built in 1921 to designs by Frank Tugwell. The stage was first extended for live performances in 1957 and two years later the proscenium was widened. In 1968, when the stage-area was further enlarged by the impresario Robert Luff to accommodate The Black and White Minstrel Show, the elaborate classical white faience façade was hidden behind plain cladding which has not worn well. It would be optimistic to say the place has an uncertain future. In fact, the chances of its survival don’t look favourable. The chartered surveyor Mark Rothery described the building as “past the point of saving for refurbishment” in 2010, and English Heritage has twice declined to list it. The lessee since 2002, Barrie Stead, has estimated that refurbishment would cost at least £5 million, and regeneration would need at least £250,000 pa revenue subsidy. 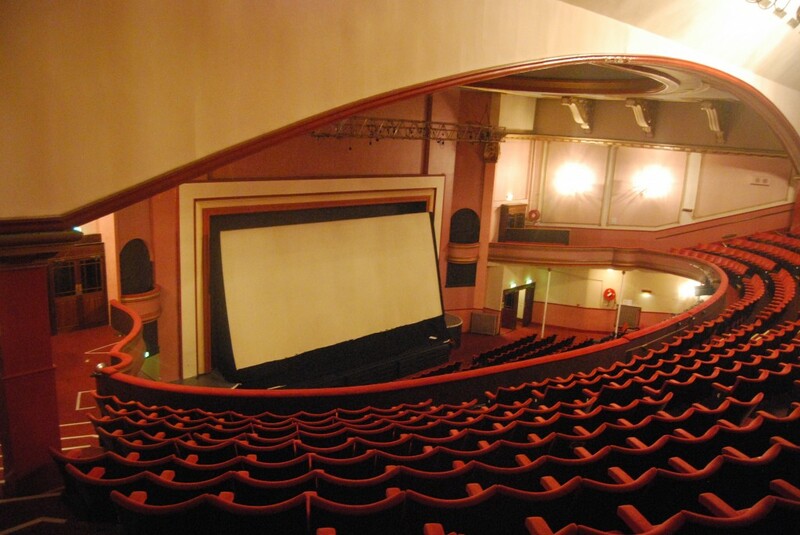 Its owners, Scarborough Borough Council, have promised to mothball the building for three months to allow the Save Our Futurist campaign [https://www.facebook.com/savethefuturist and http://www.savethefuturist.co.uk/contact/4580371634] to present a £3 million business plan to regenerate the existing auditorium: http://www.thestage.co.uk/news/2014/01/scarborough-council-close-futurist-theatre-operator-negotiations-fail. Despite the submission of a 4,000-signature petition in November 2013, the fact remains that for the moment no-one has produced a practical plan for the site as an alternative to the Council’s plans for demolition and redevelopment. An apparently separate e-petition shows 870 signatures: http://www.yorkshirepost.co.uk/news/main-topics/general-news/scarborough-s-futurist-theatre-closes-as-saviour-is-sought-1-6354622. Time is short. It’s a tall order to persuade the local politicians to stall their plans and give the Futurist a further chance of survival. This entry was posted in Fun Palaces on January 29, 2014 by Mike Higginbottom. 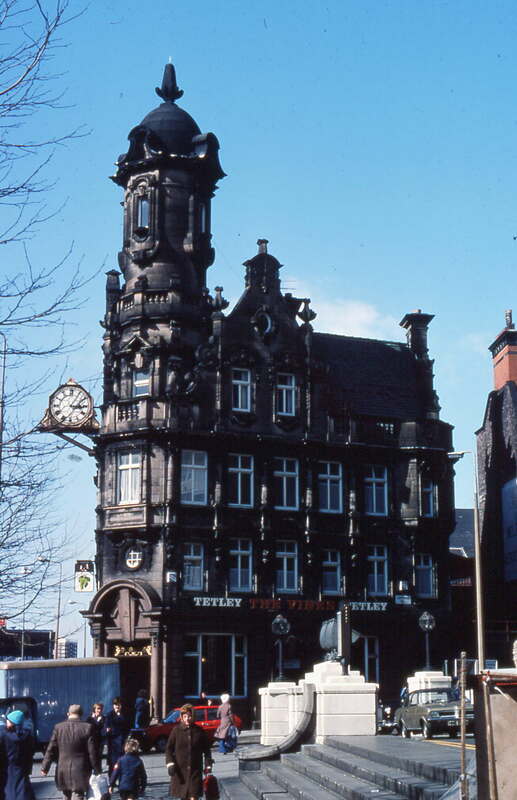 The Vines Hotel, next door to the Adelphi, is a sister pub to the splendid Philharmonic Hotel on Hope Street, designed by the architect Walter Thomas. It’s a little later than the Phil, opened in 1907, so its mahogany, copper, glass and plaster interior has a distinctly Art Nouveau feel. Alcohol has been served here since 1823, and the present building takes its name from its late-Victorian licensee, Albert B Vines, who came to the site in 1867. The Vines will usually give you a fairly rockin’ Friday, Saturday and indeed Sunday evening provided what rocks you are karaoke and somebody’s grandmother pinching your arse. Architectural-history enthusiasts may choose to visit for breakfast. One of the great Liverpool experiences is having a drink – or perhaps more than one drink – in the Philharmonic Hotel (1898-1900) on the opposite corner of Hope Street to the Philharmonic Hall from which it takes its name. This palace of a pub is the result of a partnership of the architect Walter W Thomas and Robert Cain’s Brewery during the great boom in public-house building at the turn of the nineteenth century. Thomas was well-funded and fortunately placed to call on the formidable design-skills of the Liverpool University School of Architecture and Applied Art and of the Liverpool craftsmen who executed the decorative schemes of the interiors of the great ocean-liners built by Cammell Laird across the Mersey in Birkenhead. The exterior of the Philharmonic Hotel is an odd combination of Scottish Baronial and Art Nouveau, with elaborate iron gates by the German-American artist H Blomfield Bare, who also designed the repoussé copper panels inside. The interior scheme was co-ordinated by George Hall Neale and Arthur Stratten, who employed Charles J Allen to produce the distinctive plaster caryatids and atlantes in the billiard room (the former modelled by his friend Mrs Ryan), the Irish plasterer Pat Honan and the stone-carver Frank Norbury. The gentlemen’s lavatories at the Philharmonic Hotel are not to be missed. 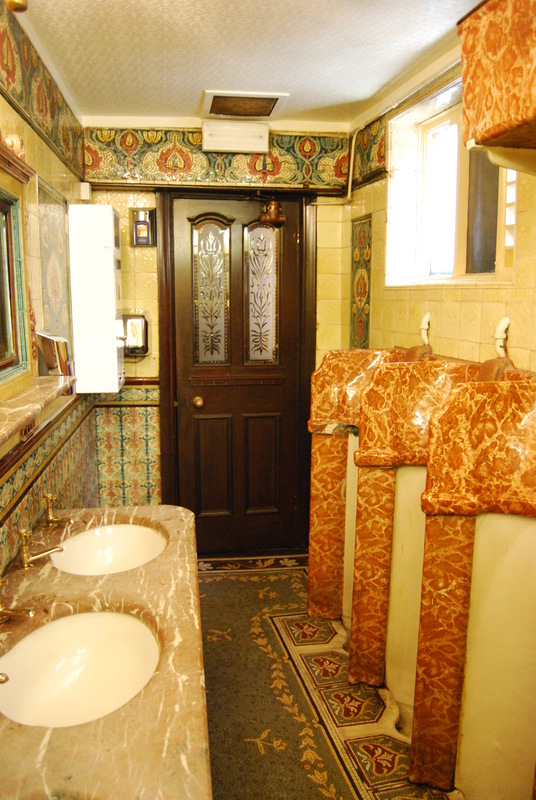 Indeed, the protocol is that any respectable lady customer can ask any respectable gentleman customer to check the coast is clear so she can admire the marble, the mosaic and the brass-work of this palatial pissoir. John Lennon declared that one of the disadvantages of fame was “not going to The Phil any more”. This entry was posted in Cemeteries, Sewerage & Sanitation, Fun Palaces, Life-enhancing experiences, Liverpool's Heritage, Victorian Architecture on January 29, 2014 by Mike Higginbottom. I once booked a Cinema Theatre Association Liverpool tour primarily on the strength of seeing On Golden Pond on the big screen at the Philharmonic Hall. 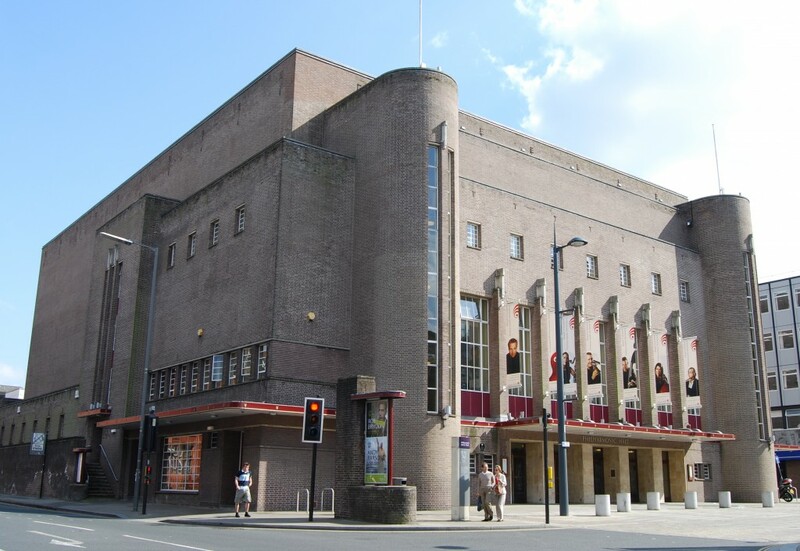 The Philharmonic Hall is a 1937-9 rebuild, replacing a predecessor of 1846-9 which had been burnt down in 1933. 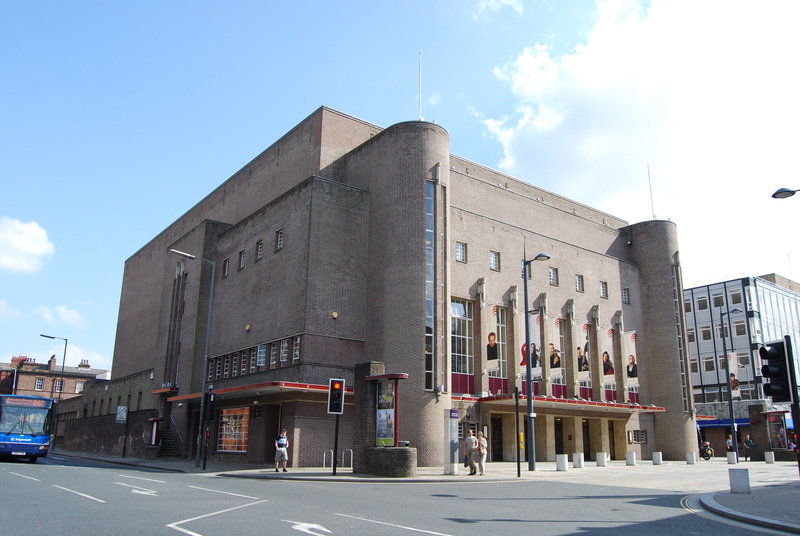 It’s a very fine Art Deco auditorium, designed by Herbert J Rowse whose other distinguished Liverpool designs include India Buildings, Martin’s Bank and the ventilation shafts [see https://www.flickr.com/photos/liverpoolpictorial/7710001254/in/photostream] and other structures for the Mersey Tunnel. The 1,700-seat auditorium has a continuous rake of stalls seats with horseshoe boxes and a balcony: the suspended ceiling has troughs containing indirect lighting fittings. It’s the home of the Royal Liverpool Philharmonic Orchestra, Choir and Youth Orchestra, which together have an outstanding history of performance dating back to the foundation of the Liverpool Philharmonic Society in 1840: http://www.liverpoolphil.com. The CTA was attracted to this temple of serious music was to hear the three-manual Rushworth & Dreaper concert organ, which is fitted with tremulants, a feature commonly found in theatre-organ specifications. Though lacking the drums, chimes and whistles of a conventional cinema-organ it was clearly intended for use in film presentations as well as for performances across the classical repertoire. Its console is mounted on a revolving lift, and can be played from below stage or in full view of the audience. Even more unusual, and unmissable if you’re a serious cinema buff, is the seven-ton rising proscenium, now apparently the only example in working order anywhere in the world: http://www.arthurlloyd.co.uk/Liverpool/PhilharmonicHallLivepool.htm#screen. This cinema screen, complete with footlights and curtains and fitted with integral sound speakers, rises from the stage-floor in three minutes, uniquely transforming the concert hall into a movie palace before the eyes of the audience. That’s an experience you can only have at the Philharmonic. This entry was posted in Fun Palaces, Liverpool's Heritage on January 29, 2014 by Mike Higginbottom. 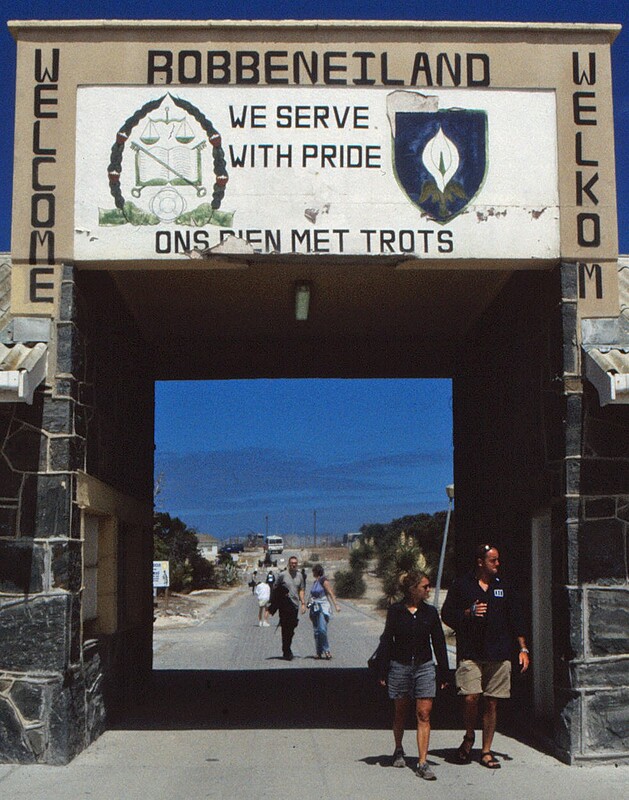 The single essential place to visit in Cape Town is Robben Island, the flat, parched patch in the bay where political prisoners have been incarcerated within sight of the city since the seventeenth century, and where three of the post-apartheid presidents of South Africa spent years of their lives – most famously Nelson Mandela (imprisoned on Robben Island 1962-1982, eventually released 1990), and also the third president Kgalema Motlanthe (imprisoned 1977-1987) and the present incumbent, Jacob Zuma (imprisoned 1963-1973). When Robben Island wasn’t in use as a prison it served as a leper colony, where the lepers were originally admitted voluntarily but eventually brought there involuntarily. It was also used as a medium-security prison for criminals. It is a miserable place, yet unexpectedly uplifting. When I visited Cape Town I made a point of booking a Robben Island tour [http://www.robben-island.org.za/index.php?option=com_content&view=article&id=10&Itemid=11], and the white man who sold me my ticket was once Nelson Mandela’s jailer, the black man beside him behind the counter an ex-prisoner. Over on the island, a thirty-minute catamaran trip away, we were bussed past the former leper colony, the lighthouse and the view of Table Mountain, before being introduced to the prison-guide, another ex-prisoner. All tours are guided by ex-prisoners, so you get the message directly. At one point the group simply sits in a meeting room to question the guide. One tourist asked what was the greatest injustice done on the island, and the guide simply replied that the removal of freedom, the deprivation of life’s opportunities was the essential injustice. I told him he’d taught me that much good occurred on the island, and he said, yes, the prisoners learned to depend on each other, to support and to develop their potentialities. We were a community of people who ranged from the totally illiterate to people who could very easily have been professors at universities. We shared basically everything. The years out there were the most productive years in one’s life, we were able to read, we read all the material that came our way, took an interest in the lives of people even in the remotest corners of this world. To me those years gave meaning to life. A clip about Robben Island featured in the BBC News coverage of the death of Nelson Mandela. I’ve no way of knowing if Christo Brand, featured in the clip, was the man I spoke to when I visited in 2000: http://www.bbc.co.uk/news/world-africa-25296656. This entry was posted in Exploring South Africa, Life-enhancing experiences on January 28, 2014 by Mike Higginbottom. Not far from District Six is an area of Cape Town called Bo-Kaap, formerly known as the Malay Quarter. This is a Muslim area, occupied by a community that’s been there virtually as long as the Dutch, over three hundred years. They’re known as the Cape Malays, from their patois not their origin. The ancestors of the Cape Malays were slaves brought to Cape Town by the Dutch settlers from other parts of Africa, from Indonesia and other parts of south-east Asia as well as the Malay Kingdoms. Bo-Kaap’s survival is an indicator of the crassness of the social system that blighted South Africa. Because the area was racially homogenous the apartheid government simply ignored it, leaving its distinctive pale-painted architecture intact. Stretching up the slopes of Signal Hill, the streets are spacious and attractive, and it’s ironic that in the post-apartheid era they’ve become highly desirable. 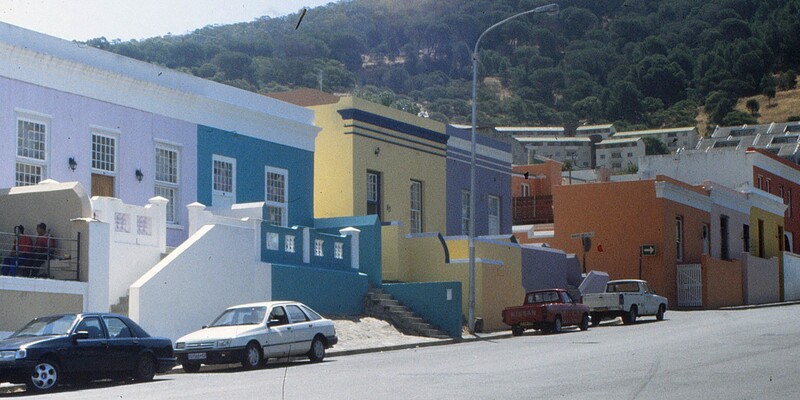 The Bo-Kaap Museum at 71 Wale Street is an example of some of the earliest property-development in Cape Town, dating back to the end of the eighteenth century. It’s now restored to show the lifestyle of the early-nineteenth-century Cape Malay Community. 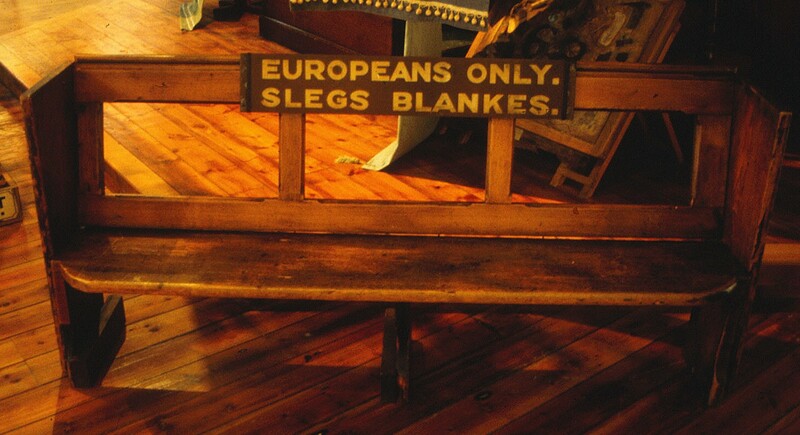 The Museum is a fascinating introduction to a community that has survived remarkably intact from the earliest history of foreign settlement at the southernmost tip of Africa: http://bokaap.co.za/museum. This entry was posted in Exploring South Africa on January 28, 2014 by Mike Higginbottom. I first learnt about the poet Tatamkhulu Afrika when his poem ‘Nothing’s changed’, about post-apartheid South Africa [http://www.bbc.co.uk/learningzone/clips/tatamkhulu-afrika-nothings-changed-and-district-6/10291.html], appeared in a GCSE English anthology that I taught to fifteen-/sixteen-year-olds around 1999-2002. The video-clip that came with the anthology [http://www.bbc.co.uk/learningzone/clips/tatamkhulu-afrika-nothings-changed-and-district-6/10291.html] revealed that, despite his pen-name, given to him by the ANC’s militant wing Umkhonto We Sizwe, he looked like a white man. Tatamkhulu Afrika (1920-2002) was actually of Egyptian and Turkish descent, adopted by White South African parents who concealed his ethnic origin in order to give him better opportunities under apartheid. As an adult he rebelled against this, converted to Islam and lived in the cosmopolitan community of District Six in Cape Town. The poem expresses his anger at the destruction of District Six after the government declared it a white-only area and razed the buildings, exiling the polyglot population to the bleak Cape Flats area, a fifteen-mile rail journey from the city centre. During the time I was repeatedly working with ‘Nothing’s changed’ with classes of teenagers, I happened to take a trip to South Africa and spent time in Cape Town. I made a point of persuading a tour-guide to take me to the District Six Museum: http://www.districtsix.co.za. The Museum is in a Methodist chapel (one of the numerous places of Christian worship that were left standing) and the coloured guide was a veteran of the injustice. Showing us a display of identity cards, alongside a whites-only park bench and a whites-only taxi-rank sign, he was able to point to his own picture. It’s hard to comprehend the bitterness and anger that apartheid generated, and impossible not to admire the way that the new South Africa, for all its imperfections, has travelled so far in the twenty years since the abolition of apartheid. 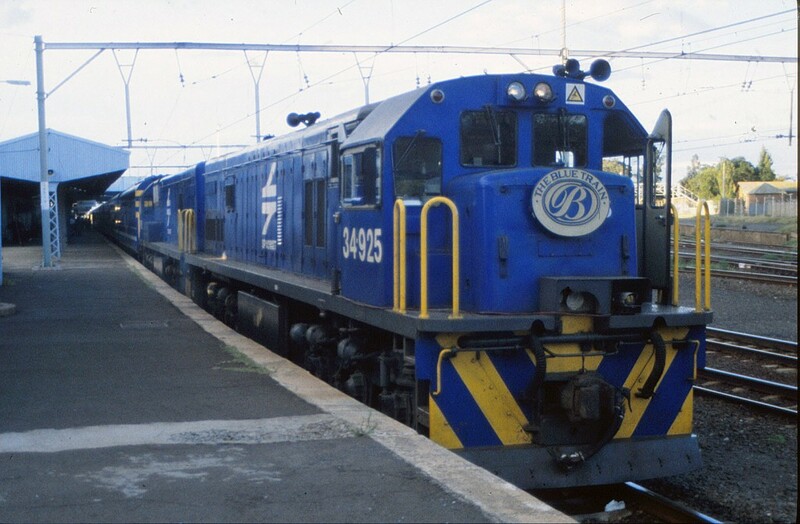 Everyone deserves to be treated at least once in their lives as well as passengers are treated on South Africa’s Blue Train [http://www.bluetrain.co.za] which trundles the 990 miles between Pretoria and Cape Town at a leisurely pace in 27 hours. From the moment passengers are ushered on to the platform and then the train by the train-captain, all they need to do is ask. My butler was called Herbert. He showed me the cabin, awash with armchairs and cushions, the marquetry panelling, the marble bathroom, the mobile phone to summon him at any time, the multiplicity of light-switches and lights, the TV zapper which also controlled the venetian blinds within the double-glazed window. You can even tune the TV to the camera on the front of the locomotive, a quarter of a mile ahead, so you can see where you were going. When you have a bath on a train, the water slops up to your head or down to your feet every time you go round a bend. Everything you could possibly need was there, if sometimes not where you’d expect to find it, and every time I ventured into the corridor Herbert was invisibly in and out tidying the pencils and replacing the mineral water bottle. Everything, including the postcards and the postage, is on the house. In the lounge car I asked the barman, a young man called Wesley, if people sometimes got out of control and he said, yes, it sometimes happened. In the dining car Irene, my waitress, kept me stocked up with appropriate wines, tuning into my preference for cheese before dessert and proffering dessert wine at the appropriate moment. For lunch I had venison; for dinner ostrich. There was also afternoon tea, and pots of tea and coffee delivered to the cabin by Herbert. 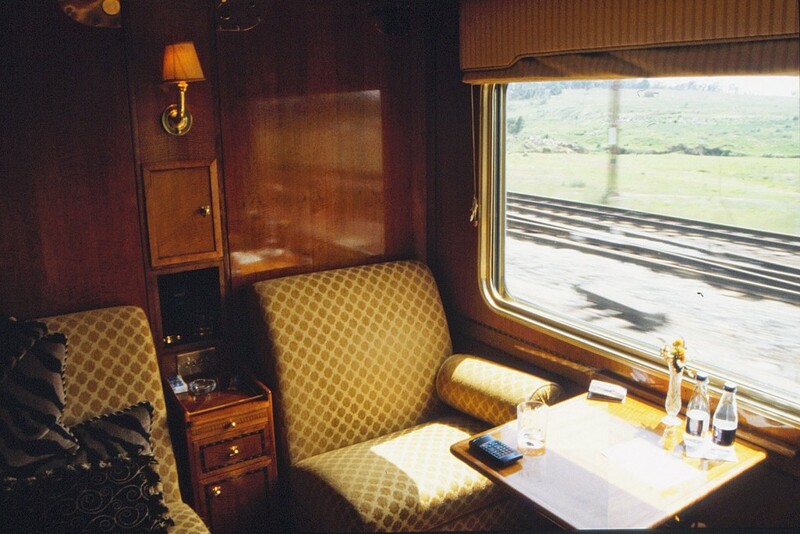 Before dinner I sat on a bar-stool watching the sunset, and drinking white wine, and returned to the bar afterwards with an English couple I’d met in the observation car, and we mulled over brandies which Wesley had expertly warmed. Very large double brandies. When I eventually went back to my suite, transformed by Herbert into a bedroom, and opened the window-blinds, the sky was ablaze with stars as we crossed the Karoo desert. For breakfast there was smoked-salmon omelette – and much, much else. I was very fortunate to make the journey in 2000, when the Rand was falling through the floor. In 2014 the single fare from Pretoria to Cape Town or vice versa is just short of £1,200. Seriously, there are far worse ways of spending that sort of money on a once-in-a-lifetime experience. Or perhaps twice in a lifetime. This entry was posted in Christmas in a T-shirt, Exploring South Africa, Life-enhancing experiences, Transports of Delight on January 28, 2014 by Mike Higginbottom.